Requires DA15 connectors, available separately under parts 161 2050, 161 2055, 161 2090 and 161 2105. Build or repair your own cables with a DA15 plug housing. Designed to work the D-Sub crimp- or solder cup-style DA15 male or female connectors. Note that this is for a two-row pin layout found in older game controllers, not three as found in VGA cables. 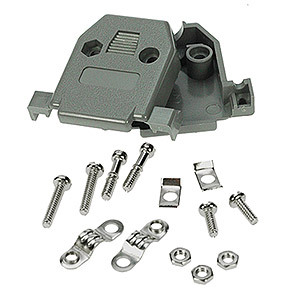 Includes 6 screws, 3 nuts and 4 clamp parts.